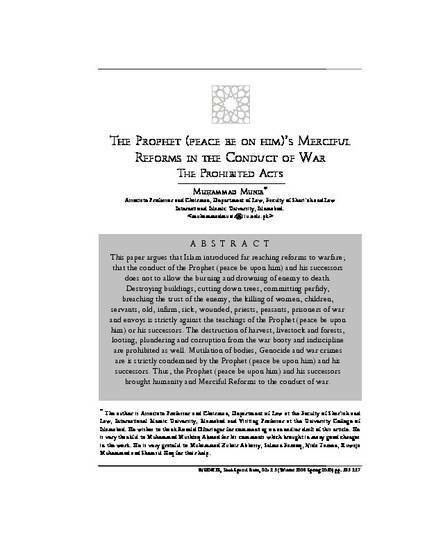 "The Prophet (Peace be Upon Him)'s Merciful Reforms in the Conduct of War: The Prohibited Acts" by Muhammad Munir, Dr. This paper argues that Islam introduced far reaching reforms to warfare; that the conduct of the Prophet (peace be upon him) and his successors does not to allow the burning and drowning of enemy to death. Destroying buildings, cutting down trees, committing perfidy, breaching the trust of the enemy, the killing of women, children, servants, old, infirm, sick, wounded, priests, peasants, prisoners of warand envoys is strictly against the teachings of the Prophet (peace be upon him) or his successors. The destruction of harvest, livestock and forests, looting, plundering and corruption from the war booty and indiscipline are prohibited as well. Mutilation of bodies, Genocide and war crimes are is strictly condemned by the Prophet (peace be upon him) and his successors. Thus, the Prophet (peace be upon him) and his successors brought humanity and Merciful Reforms to the conduct of war. The publisher allows the use of this work for educational purposes.